Gulf Labor Coalition, G.U.L.F. Pamphlet for NYU and Guggenheim Actions, 2015, courtesy Noah Fischer. Based in New York since 2011, Gulf Labor Coalition is a group of artists and activists who work together to expose the scandalous conditions of recruitment, working, and living for laborers employed in the construction of museum complexes in Abu Dhabi (including branches of the Louvre and the Guggenheim, as well as the Sheikh Zayed National Museum). Gulf Labor was founded in response to a report published by Human Rights Watch in 2009. In solidarity with the workers, Gulf Labor publicizes abuses and tries to enforce respect for workers’ rights by the investors, which are prestigious artistic institutions. In order to do so, Gulf Labor Coalition makes use of the artistic competence of its members, namely their coefficient of visibility, as some of them are internationally recognized as artists and intellectuals. 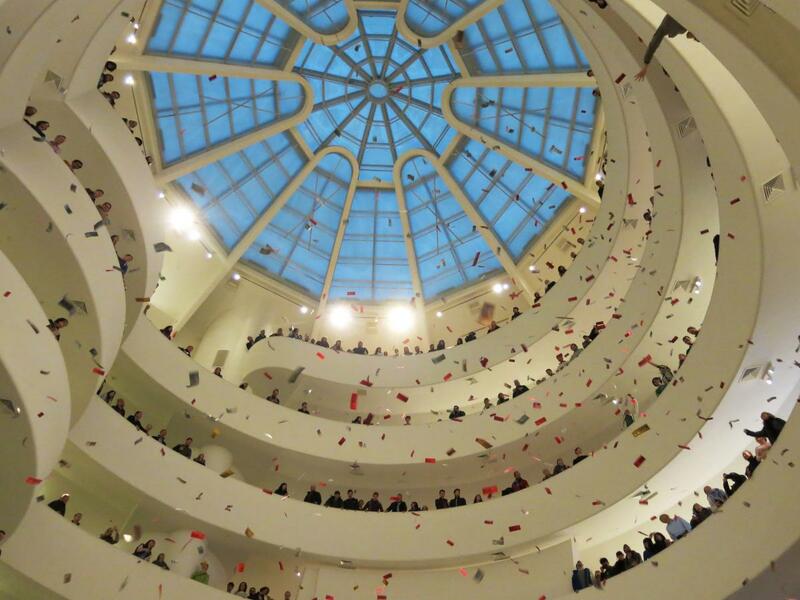 They organize boycotts, debates, direct actions and performances, and even occupied the Guggenheim Foundation in Venice during the Biennale in 2015. These actions are documented in the book The Gulf: High Culture/Hard Labor, edited by the American sociologist Andrew Ross. The exhibition presents documentation of the actions by Gulf Labor, including the Global Ultra Luxury Faction campaign, which organizes direct interventions, mainly at the New York headquarters of the Guggenheim Museum. There are also objects created by Greg Sholette and Matt Greco as part of the 52 Weeks campaign, launched in October 2013 by dozens of artists who created special actions, works, and installations especially for the event. Architectural figures designed by Sholette and Greco were “shop-dropped” into the gift shop at the Guggenheim Museum (see: 1:1 scale), but instead of presenting the museum’s iconic buildings, they model the workers’ housing barracks on the museum’s property in Abu Dhabi. The report presented in exhibition consists of the photographic documentation of direct actions by G.U.L.F. 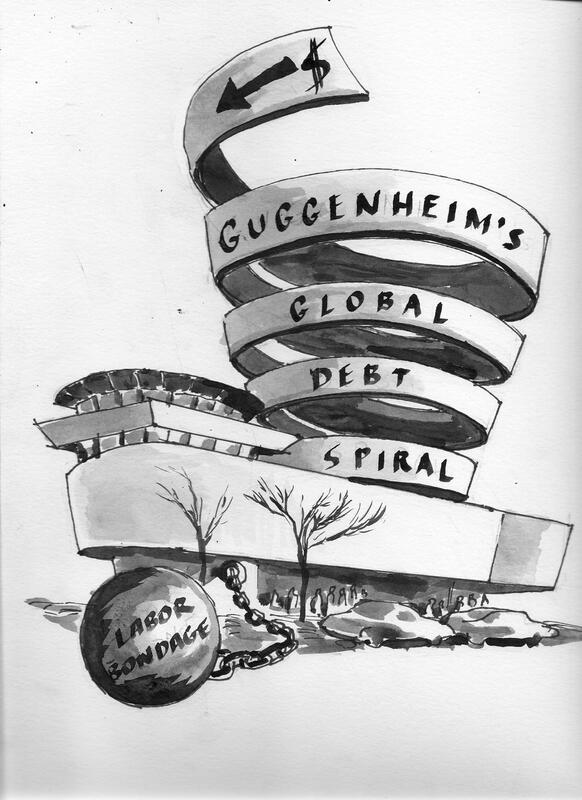 (Global Ultra Luxury Faction): Guggenheim Petro-Dollars Rain Down, Rebranding the Guggenheim for Exploiting Migrant Workers in Abu Dhabi, and The Venice Occupation (courtesy G.U.L.F. ); the print, Gulf Labor’s official banner at the 56th Venice Biennale (courtesy G.U.L.F. ); the illustrations, The Dirty Currency of Artworld Speculation (courtesy Noah Fischer); the pamphlet, G.U.L.F. Pamphlet for NYU and Guggenheim Actions (courtesy Noah Fischer); the prints, Eat Up! Speak Up! Guggenheim’s Annual Fund-raising Gala (courtesy Csaba Nemes); the model, Saadiyat Island Workers Quarters Collectable (courtesy Matt Greco and Greg Sholette) and the print, Of Saadiyat’s Rectangles & Curves, or Santiago Sierra’s One Sheikh, Two Museum Directors, Three Curators, One University President, Two Architects, and One Artist Remunerated to Sleep for 30 Days in 13 x 14 foot Windowless Room with Shared Bathroom and No Door (courtesy Pedro Lasch), both realized within the framework of 52 Weeks of Gulf Labor; all licensed by the Museum of Modern Art in Warsaw for the duration of the exhibition. G.U.L.F., Guggenheim Petro-Dollars Rain Down, Rebranding the Guggenheim for Exploiting Migrant Workers in Abu Dhabi, 2014, photo courtesy Gulf Labor Coalition.